NZ Herald: John Key has been sworn in as Prime Minister in a ceremony at Government House in Wellington this morning. Mr Key, along with 24 National ministers and four support party ministers were sworn in by Governor-General Sir Jerry Mateparae. So orderly I've heard people refer to this new administration as being merely a "reshuffle". Compare this transition to another Pacific country of the Westminster type. SMH: AUSTRALIAN diplomats were caught up in Papua New Guinea's latest political meltdown as angry police threatened them with machine guns during a tense night of fighting between supporters of the country's two would-be prime ministers. 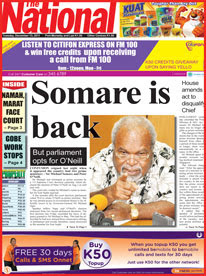 Both Sir Michael Somare and Peter O'Neill claim to be the legitimate leader of the country. Mr O'Neill has the numbers to lead the Parliament but the country's Supreme Court on Monday ordered Sir Michael to be reinstated as prime minister. Two Prime Ministers. Tahiti had the same issue a few years ago and one side occupied the presidential palace for many months until it was resolved - that case went to Paris for their colonial master to sort out. Unlike PNG and most other nations in the NZ system there are few constitutional rules that the Supreme Court would be likely to intercede to reverse. Parliament is deemed to be master of its own House in most, if not all, of their activities and changing the PM is acknowledged as a political issue for the caucus of the ruling party. Country's with formal written constitutions however bring the judiciary into the scene and things can get dicey. The last coup in Fiji that established the current "new legal order", for example, came about as the regime's reaction to a court ruling invalidating the appointment of the interim government and ordering elections be held. The PM's website doesn't exist. Maybe there are two - at different addresses? At least the civil service or whoever is in charge of government IT is neutral. So neutral, just to be sure, they've also taken down the government portal. Later, at about 10pm, bursts of automatic fire were heard as rival groups tried to enter Government House. No one has been reported injured but security across the city was being increased as the crisis deepened. ''It got a bit hairy but we're generally OK,'' one Australian official told the Herald. Mr O'Neill, who unsuccessfully tried to have one of the judges removed from the Supreme Court bench, maintains he is the country's leader and wants the Governor-General, Sir Michael Ogio, to swear him in. Late yesterday, Mr O'Neill and 60 supporters arrived to speak to the Governor-General at Government House, forcing their way through a police line surrounding the residence..
A spokesman for the Governor-General then reportedly told the O'Neill group Sir Michael Ogio would not be swearing in either of the men because he could not understand the court judgment. He preferred that the two leaders get together and resolve the issue between themselves. That is an incredibly naive suggestion. If it has got to this point having a wee chat about it and a gentleman's handshake isn't going to happen. Although claiming you can't understand the ruling is probably the best course for someone stuck in the middle and playing for time; but ultimately it will be the G-G that must make a call, they are at the top of the constitutional apex and in charge of the armed forces when it comes to the crunch. Adding to the confusing and potentially explosive situation, both Sir Michael and Mr O'Neill have support bases tied to senior police, so that as well as two would-be prime ministers, there are two would-be police commissioners each claiming the top job. The Government House flashpoint was the same venue where on August 2 Mr O'Neill was sworn in as the country's prime minister after a dramatic internal coup, which came as Sir Michael recuperated in a Singapore hospital for three months. Sir Michael, known as PNG's father of the nation, does not appear to have the numbers to maintain a parliamentary majority. The O'Neill camp yesterday sat in government parliament benches and ignored any suggestion they were anything other than the government. The Speaker, Jeffrey Nape, who in the past has been instrumental in keeping Sir Michael in power, decreed that retrospective legislation passed on Monday meant Sir Michael was not even an MP, let alone prime minister.